After my first bath in my Vancouver condo, I discovered a large puddle on the bathroom floor. The hunt for the source didn’t take long. Upon opening the tap, I noticed a steady drip-drip-drip landing on the rim of the tub and proceeding directly towards the floor. 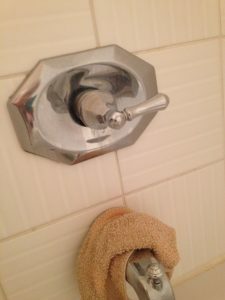 I quickly grabbed a washcloth and draped it over the faucet below to redirect the drips into the tub. I resolved to call a plumber later. Some basic things like a dining room table needed to come first. That was two years ago. The washcloth, by now a stained rag, has done yeoman service. You may wonder why it has taken so long to address this fundamental problem. I called a plumber when the toilet failed a year ago and asked him to fix the leak in the tub tap as part of the service call. He took the tap apart and couldn’t find a brand name or serial number on the cartridge, so suggested that new plumbing hardware would likely be required. That would mean removing some of the tiles. As I baulked at the idea of re-tiling my tub area, he suggested maybe he could come at it from the behind. My tub plumbing is in the wall between my condo and the hallway. The thought of getting permission from the condo board to make a hole in that wall and paying someone to repair the damage made the washcloth solution look attractive–elegant almost. A couple of friends suggested I ask the condo board if anyone else had found out how to replace the cartridge in their tub. By then I had decided to get new blinds. The issue of the dripping tap sank on my priority list. This week, Mike came, and the washcloth went. Now I have a new question. What other problems have I’ve been tolerating because I think the solution is too complex and costly? This entry was posted in Writing on December 15, 2016 by Wilda.